I have completed the Goring 10k and the Reading Half Marathon, now its time to step up to the big one! 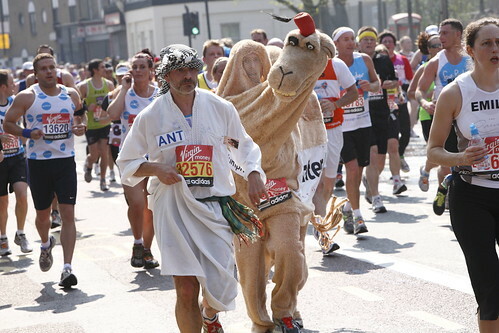 I’ll be taking part in my 19th London Marathon on the 26st April for WaterAid. I will have my trusty Sheik Mustafa (Ant Tyler) to lead me on this year. Mustafa helps me at the “water holes” and warns my two legged friends that I am storming up behind them! Please consider sponsoring this old camel in support of WaterAid projects in Bangladesh. The money will be put towards the Thames 4 Bangladesh programme serving four towns most in need of clean water and sanitation services. Your donation will have a big impact on peoples lives. Please donate now via my Sponsorship Page on Virgin Money Giving (its quick safe and secure, and all proceeds go to WaterAid). You may also spot me visiting a few offices around Reading to collect cash. If you do spot me please say hello and give generously.